Gorgeous, one owner home. 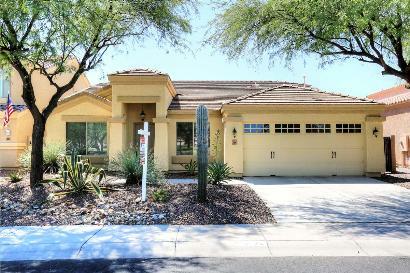 positioned in a culdesac directly across from the park in Desert Peak Planned Community in North Phoenix. The location can't be beat! Enjoy the updated superior finishes; beautiful 42'' cabinets, GE Profile appliances, smooth top cooktop and wall oven, stone back splash, Versailles pattern travertine looking tile, 5'' base, single family home with formal living, dining room, large open kitchen with granite countertops, island and eat in kitchen.